CNBC.com video published May 29, 2018: Virgin Galactic (domain: virgingalactic.com) has launched and landed a second successful supersonic flight. Richard Branson said he believes his space tourism company is just "2 or 3" flights away from making it into space, adding, he plans to be a passenger on the first flight. UPDATE: Wall Street Climbs as Worries Over Italy's Politics Ease | NYTimes.com: May 30, 2018 12:32pm EDT. Financial Times (ft.com) video above published May 27, 2018: Leaders of Italy's leading populist parties have dropped their bid to form a government after President Sergio Mattarella rejected their nomination of a Eurosceptic finance minister. 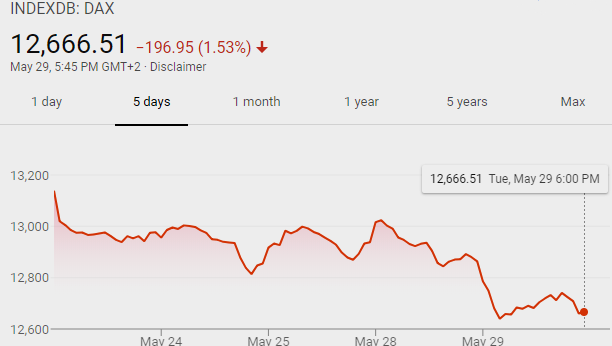 Dow Tumbles Nearly 400 Points; S&P 500 and Nasdaq Also Decline | TheStreet.com May 29, 2018: "Stocks fall sharply Tuesday as a political crisis in Italy rocks markets across the globe." Also: Investors are dumping Italian government debt | ft.com. Italian bond yields are rising rapidly because the country is laden with debt and in political turmoil. TheStreet.com's Tracy Byrnes enlisted London Bureau Chief Martin Baccardax to help explain how it will affect the rest of us. Who is was Carlo Cottarelli? Financial Times (ft.com) video above published May 28, 2018: As newly appointed prime minister, the former IMF official will focus on improving Italy's finances ahead of new elections, but many think he will immediately face a vote of "no confidence" and some now think new elections may be scheduled as early as July, 2018--major parties in Italy say Cottarelli’s mission is 'all but dead' and parliament will soon be dissolved --Italy may return to polls in July, sources say, amid market rout | Reuters.com. Italy's new election could become a referendum on the European Union and the euro--President readies Italy for snap polls to be fought on EU, euro | Reuters.com--the far-right League and anti-establishment 5-Star Movement may unite for an upcoming new election in Italy. League leader Matteo Salvini said on Monday, May 28: “Today Italy is not free; it is occupied financially by Germans, French and eurocrats ... if there’s not the OK of Berlin, Paris or Brussels, a government cannot be formed in Italy. It’s madness, and I ask the Italian people to stay close to us because I want to bring democracy back to this country.” When? New elections in Italy 'by start of 2019' at the latest or as early as autumn: Italy's president named a former IMF economist Carlo Cottarelli as caretaker prime minister to lead the country into new elections, possibly as soon as the autumn in the eurozone's third largest economy. Mr Cottarelli, 64, was director of the IMF's fiscal affairs department from 2008 to 2013 and became known as "Mr Scissors" for making cuts to public spending in Italy--rte.ie. Most Exposed to Italy’s Sovereign Debt? (Other than Italian Banks): BNP Paribas, France’s largest bank, with €16 billion of Italian sovereign debt holdings, Dexia (French-Belgian) holds €15 billion of Italian debt, and Banco Sabadell has €10.5 billion invested in Italian bonds (40% of its entire fixed asset portfolio, worth €26.3 billion, and 110% of its tier-1 capital)--WolfStreet.com. ECB & Eurozone: Banque de France to pursue efforts to spur consolidation of Europe's financial sector: Villeroy | Reuters.com--Editor's note: if consolidation is "encouraged," Europe may end up with a few (5 or 6?) large banks (mostly German or French) controlling the EU/eurozone financial sector. The five largest commercial banks in the U.S. had 44 percent of total assets in the banking system as of 2014 (most likely even more now). Unlike the U.S., however, Europe still has a lot of large "troubled" banks with underlying financial problems--consolidation now could exacerbate a situation the ECB has failed to remediate. Financial Times (ft.com) video published May 18, 2018: Technology billionaire Elon Musk says his planned underground network beneath Los Angeles would carry passengers at 100 mph for just a dollar per trip. 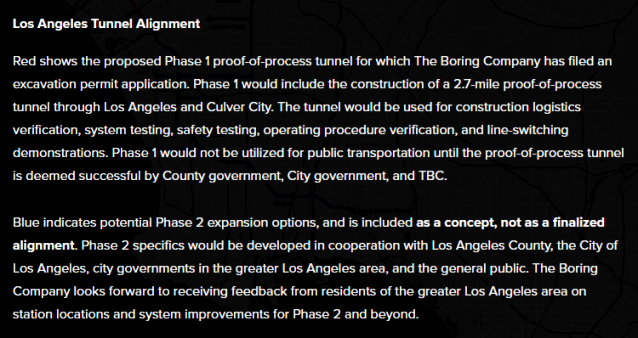 The Boring Company is an infrastructure and tunnel construction company founded by Elon Musk, December 17, 2016, at Los Angeles, CA. Bloomberg.com video published May 15, 2018: Intelligent, indestructible and with no humans on board, these sailboats are plotting their own course through the waters of San Francisco Bay. If Founder & CEO Richard Jenkins gets his way, soon there’ll be hundreds of them – trawling the oceans for data. Video by Victoria Blackburne-Daniell, David Nicholson. Saildrone Inc.--"Ocean data redefined"--Saildrone designs and manufactures wind and solar powered autonomous surface vehicles called Saildrones, which make cost-effective ocean data collection possible at scale, building the world's largest high resolution ocean datasets, working with governments and private companies around the globe. Headquarters: Alameda, CA USA. Richard Jenkins, Founder & CEO. 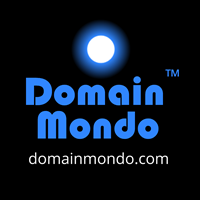 Domain Mondo's weekly internet domain news review (NR 2018-05-27) with analysis and opinion: Features • 1) GDPR Effect: ICANN Sues German Domain Name Registrar, 2) EU GDPR & ICANN WHOIS, What's Next for ICANN? 3) ICANN news: At-Large Review, GNSO, FY19 Budget, June Public Comments, 4) Names, Domains & Trademarks, 5) ICYMI, 6) Most Read Posts. As disclosed by ICANN, in rejecting the injunctive relief, the Court ruled that it would not require EPAG to collect the administrative and technical data for new registrations. The Court said that the collection of the domain name registrant data should suffice in order to safeguard against misuse the security aspects in connection with the domain name (such as criminal activity, infringement or security problems). The Court reasoned that because it is possible for a registrant to provide the same data elements for the registrant as for the administrative and technical contacts, ICANN did not demonstrate that it is necessary to collect additional data elements for those contacts. The Court also noted that a registrant could consent and provide administrative and technical contact data at its discretion. "While ICANN appreciates the prompt attention the Court paid to this matter, the Court's ruling today did not provide the clarity that ICANN was seeking when it initiated the injunction proceedings. ICANN is continuing to pursue the ongoing discussions with the European Commission, and WP29, to gain further clarification of the GDPR as it relates to the integrity of WHOIS services." --John Jeffrey, ICANN's General Counsel and Secretary. a. Tucows (tucows.com), parent company of EPAG, the German Registrar sued by ICANN (see below) on Friday, has responded to ICANN in a statement on its website--Tucows Statement on ICANN Legal Action | Tucows Inc. | tucows.com--excerpt: "... We realized that the domain name registration process, as outlined in ICANN’s 2013 Registrar Accreditation Agreement, not only required us to collect and share information we didn’t need, it also required us to collect and share people’s information where we may not have a legal basis to do so. What’s more, it required us to process personal information belonging to people with whom we may not even have a direct relationship, namely the Admin and Tech contacts. ICANN’s goal since discussions about the impact of the GDPR on domain registration began has been to preserve as much of the status quo as possible. This has led ICANN to attempt to achieve GDPR-compliant domain registration via ‘process reduction’, as opposed to Tucows’ approach of starting with the GDPR and rebuilding from the ground up. These two approaches have led to significantly different results, and consequently a need to determine whether ICANN’s insistence on the collection of the full thick Whois data and this data’s transfer to gTLD Registries is in compliance with the GDPR. It is this disagreement and need for legal clarity that is at the heart of the lawsuit filed by ICANN ... we perceive three core issues with the [ICANN org / ICANN Board] Temporary Specification that we do not believe are compliant with the GDPR. These issues are the collection, transfer, and public display of the personal information of domain registrants and the other contractually-mandated contacts ... ICANN will need to prove that the minor, marginally incremental benefit of collecting, processing and transferring Admin and Tech contact data at the request of third parties outweighs the principles of data minimization and lawful processing enshrined in the GDPR. We find the argument that duplicative technical contacts are necessary for the security and stability of the DNS implausible. We were not convinced this was the case when we first examined the law, and we remain unconvinced following the release ICANN’s Temporary Specification ..."
"The technical contact and the administrative contact have important functions. Access to this data is required for the stable and secure operation of the domain name system, as well as a way to identify those customers that may be causing technical problems and legal issues with the domain names and/or their content. 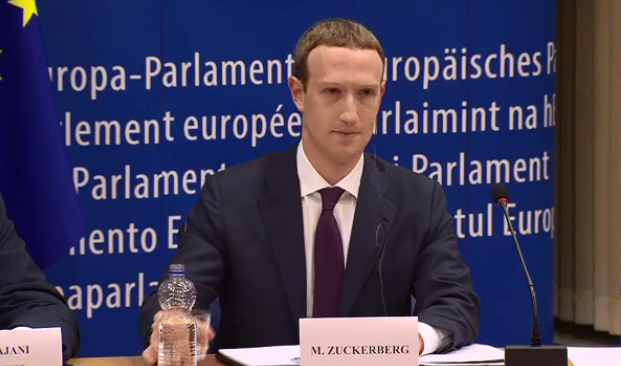 Therefore, GDPR provisions do not prevent the Defendant from collecting these data elements. If the Defendant does not collect the requisite technical contact or administrative contact information among other things, the secure operation of the domain name system and other legitimate uses of the data, such as law enforcement trying to locate bad actors that use the domain name system for criminal activity, will be in jeopardy. Accordingly, the Applicant has attempted to convince the Defendant that it is still obligated under its contract with the Applicant to collect the administrative and technical contact information as part of the registration data it collects at registration. The parties were not able to solve this issue out of court. Therefore, the Applicant kindly asks the court to order the Defendant by way of preliminary ruling, not to sell respective new domain name registrations without collecting such data." • Temporary Specification for gTLD Registration Data | ICANN.org: effective as of 25 May 2018; Adopted on 17 May 2018 by ICANN Board Resolutions 2018.05.17.01 – 2018.05.17.09. Temporary Spec PDF here [735 KB]. "As you know, on 17 May 2018, ICANN posted an announcement regarding the Board’s adoption of the Temporary Specification for gTLD Registration Data. The Temporary Specification, effective 25 May 2018, modifies contractual obligations in ICANN's agreements with registries and registrars in order to comply with Europe's General Data Protection Regulation [GDPR]. It does not include a compliance moratorium since ICANN must also comply with the law. ICANN Contractual Compliance will enforce the Temporary Specification from the effective date and address any areas of non-compliance with the contracted parties per the established process." • For further background see last week's News Review | ICANN's GDPR Train Wreck 25 May 2018 & Beyond. Editor's note--Bottom Line: EU law (GDPR) trumps ICANN bylaws and ICANN's contracts with its gTLD Registry Operators and accredited Registrars. ICANN believes its interpretation of the GDPR and its application to the collection, processing, and publishing of WHOIS data is correct, but ultimately, EU DPAs (data protection authorities) and European Courts will decide, not ICANN. My own opinion is that current WHOIS policy collects much more data than is necessary or appropriate. The relevant questions are: 1) Who is the legal registrant (or representative of the registrant) of a domain name, and 2) how can that person be contacted? Registrants should be able to choose to list their name, address, and email and phone data (fax is an anachronism), or appoint an agent ("Registrant's Agent" which could include an accredited WHOIS privacy provider) for public WHOIS purposes. As a default, and to comply with the GDPR, if the registrant fails to choose one of the above methods for the Public WHOIS, the domain name's registrar of record should be listed as registrant's agent since most domain disputes (e.g., UDRP and URS) are essentially in rem or quasi in rem actions. It really should be that simple, but I am afraid ICANN is "lost in La-La Land." Michele Neylon (pp 15-16): "... if you look at the history of Whois related activities over the last, I don't know how many years, pretty much everything has failed in one shape or another. This time around there really is no room for failure. The other point as well, I put that in the chat, is that I had asked during the GDD Summit last week in Vancouver and it needs to be asked again, is that we do need to see some kind of list of the policies and contractual clauses that are impacted by this temporary spec, because this EPDP will need to address those things specifically." Stephanie Perrin (p.37): "I think it would be worthwhile even though we have very little time if the RDS Working Group more or less formerly - formally assessed how it failed ..."
See also Contracted Party House (CPH) (Registrars & Registry Operators) Statement of concern for At-Large Review Implementation Overview Proposal bunton-to-chalaby-07may18-en.pdf [59.5 KB]. b. Infringement: The Real Pirate Bay "operates from an .org domain name, which happens to be managed by the US-based Public Interest Registry (PIR) ..."--TorrentFreak.com. c. FBI seizes domain behind VPNFilter botnet | scmagazine.com: "evidence exists showing the domain toknowall.com was to be used as part of an attack." a. UK To Tackle 'Wild West' Internet--the UK government will publish a policy 'white paper' later this year setting out proposals for future legislation, aiming to enact new laws “in the next couple of years” said digital minister Matt Hancock May 20, 2018.
b. US Net Neutrality Is Just a Gateway to the Real Issue: Internet Freedom | WIRED.com May 18, 2018.
c. The Path to Victory on Net Neutrality in the House of Representatives and How You Can Help | Electronic Frontier Foundation | EFF.org May 18, 2018.
d. IGF 2018 Call for Workshop Proposals | Internet Governance Forum | intgovforum.org: The deadline for workshop submissions is 27 May 2018, 23:59 UTC. The final selection of workshops will take place during the IGF 2018 Second Open Consultations and MAG Meeting, scheduled on 11-13 July 2018 in Geneva, Switzerland. Yelp asks Europe to take new antitrust action against Google | SearchEngineLand.com May 22, 2018: "Complaint to European Commission applies the logic of the Shopping Search case to local search." See also How to survive Google’s new local search world | SearchEngineLand.com May 21, 2018: "We are seeing result pages where Google features occupied virtually the entire page and organic web page results were barely visible" and How did Google get so big? 60 Minutes | CBSnews.com. EU officials are encouraging countries like Brazil, Japan, and South Korea to adopt laws similar to the GDPR by tying data protection to trade deals--NYTimes.com. South Africa Domain Admin Lauds GDPR, POPI | allAfrica.com: "The ZACR wholeheartedly supports the objectives of both the EU's data protection regulations and South Africa's very own POPI," said Lucky Masilela, ZACR CEO [ZACR is registry operator of South Africa's ccTLD .ZA and gTLD .AFRICA]. GDPR: US news sites unavailable to EU users under new rules | BBC.com May 25, 2018: Some US news sites like the LA Times and the Chicago Tribune restrict access from EU as GDPR goes into effect. GDPR mayhem: Programmatic ad buying plummets in Europe | Digiday.com. 2. Tech Review | Tesla $TSLA May Need A Takeover, Will Apple $AAPL Bite? Tech Review (TR 2018-05-26)--Domain Mondo's weekly review of tech news with commentary, analysis and opinion: Features • 1) Powering the Internet of Things, 2) Switzerland & Crypto, 3) Investing: The Week, Investing Notes: Mnuchin on Monopolies; Trading Nvidia; Crypto Party? 4) ICYMI Tech News. Investing Notes: Mnuchin on Monopolies; Trading Nvidia; Crypto Party? a. Tech Monopolies & Antitrust--U.S. Treasury Secretary Steven Mnuchin on CNBC TV, May 21, 2018 (video at 16:07) Mnuchin: ".... stock market is up an enormous amount since the election [of President Trump in 2016] and with all of our economic plans in place I wouldn't be surprised to see it higher by the end of the year . Q: Did you see 60 Minutes [CBS TV show] last night Mr. Secretary? Mnuchin: I did not. Q. [It was about] Google, it was interesting, that's a hell of a company obviously but when you get that good and have that great a moat you wonder if it's a monopoly or not. I just wondered if you view Google as a monopoly? Mnuchin: Well I would just say the issue of monopolies is out of my lane, that is within the Justice Department but I think these are issues that the Justice Department needs to look at seriously, not for any one company, but obviously as these technology companies have a greater and greater impact on the economy, I think that you have to look at the power they have and it's something that the Justice Department, I hope, takes a serious look at without me making any comments as to whether they should be or they shouldn't be, but these issues deserve to be reviewed carefully. b. NVIDIA (NASDAQ:NVDA) Trading Mistake--No Emotional Detachment--SeekingAlpha.com. See also Nvidia: Covered Call Strategy | SeekingAlpha.com. c. Cryptocurrency--The Party's Over--State regulators unveil nationwide crackdown on suspicious cryptocurrency investment schemes | WashingtonPost.com. See also "... there are so many crypto-tokens out there that it’s hard to gauge whether any new entrant can get traction"--Martha Bennett, an analyst at Forrester, in TechnologyReview.com (emphasis added). See also Bitcoin Price Manipulation Probe Launched By Justice Department | Bloomberg.com May 24, 2018: DOJ & CFTC criminal investigation into alleged market manipulation of bitcoin and other cryptocurrencies. Google and Facebook Face GDPR Privacy Complaints on 1st Day | Fortune.com May 25, 2018. How China’s Tencent Uses Deals to Crowd Out Tech Rivals | WSJ.com: The social-media and videogame giant bought stakes in 277 tech companies since 2013, and its deal-making pace is accelerating. See also In Silicon Valley, Chinese 'accelerators' aim to bring startups home [to China] | Reuters.com. Google and Facebook: Fake News No Problem: Internet Totally Dominates Advertising in the US, But Only 2 Companies Divvy up 60% of the Spoils | WolfStreet.com. Tesla Model 3 Review Falls Short of Consumer Reports Recommendation | consumerreports.org: "Despite record range and agile handling, issues with braking, controls, and ride quality hurt the Model 3’s Overall Score"
The European Commission (EC) is organising on 25th May 2018 3 events to mark the entry into application of the EU General Data Protection Regulation (GDPR): one in Brussels, one in New Delhi and one in Santiago de Chile. This event will be opened by Ms Věra Jourová, Commissioner for Justice and Consumers and Ms Andrea Jelinek, Head of Austria’s Data Protection Authority and Chair of the European Data Protection Board. It will feature speakers from the political sphere, civil society and businesses. You may follow this event via web streaming from 2pm (local time Brussels) Friday, May 25, 2018. Submit questions at: www.slido.com/gdpr25may. New Delhi and Santiago: On the same day, the Commission is also organizing two international events in New Delhi and Santiago to celebrate "our shared values with key partners in Asia and Latin America" as well as the opportunities of convergence in the area of privacy. European Data Protection Supervisor (EDPS) video published Mar 27, 2018: The EDPS Giovanni Buttarelli presents the Annual Report 2017 at Committee on Civil Liberties, Justice and Home Affairs, 20 March 2018, Brussels. a specific Directive (680/2016) on data protection in the area of police and justice, adopted on 5 May 2016, applicable as of 6 May 2018." Update of handbook on European data protection law | European Union Agency for Fundamental Rights | fra.europa.eu: "The Agency is updating its 2014 handbook on European data protection law, in partnership with the Council of Europe and the European Court of Human Rights (ECtHR). It will present and explain European data protection law in a straightforward way for those working in this area. It will be of interest to non-specialised legal professionals, national judges and legal professionals, as well as national data protection authorities (DPAs)." Expected to be available May 25, 2018. Southeast Asia's largest economy has seen a flurry of homegrown tech successes, led by $5 billion ride-hailing firm Go-Jek (domain: go-jek.com). Willson Cuaca of East Ventures (domain: east.vc) and Donald Wihardja of Convergence Ventures (domain: convergencevc.com) explain why, and how, Jakarta can keep the hits coming. Reuters release date: 11 May 2018.